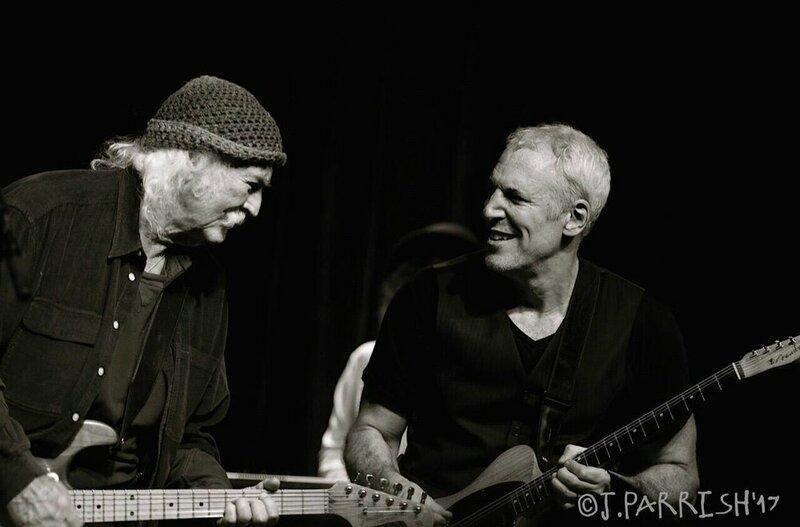 Over the years Jeff has shared the stage with David Crosby in various musical combinations. Jeff was partners with David and James Raymond in their band, CPR which released 4 albums of co-written material, featuring many songs Jeff co-wrote. Prior to that ensemble, Jeff also performed in a trio with David & Graham Nash for a number years including a bucket-list show at Carnegie Hall in 1993. Jeff also toured with Crosby, Stills & Nash in 2004 and 2005. In 2017, Jeff was contacted by David Crosby to tour together after a 12-year hiatus of working together. Jeff joined David, Davids’ son, James Raymond, and CPR alumni Steve Distanislao, along with new friends, Mai Agan, and Michelle Willis for tours that included playing the Tonight Show with Jimmy Fallon and upcoming shows in 2019 playing at Red Rocks with Jason Isbell. There is a live CD from the Crosby 2018 Tour in Europe soon to be released. Jeff also played on Crosby’s 2017 release Sky Trails. Here is a 5 star review from the last European tour date in London at Shepards Bush Empire Theatre.